Can't wait an hour for the plank to soak? Thats right, I have tested this and it works GREAT. 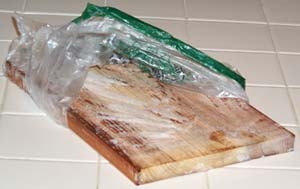 Soak a plank or two for at least two hours, wipe off the access water, oil the smooth side and put them in your freezer. If you like, you can put them in a plastic bag left over from your groceries. The only thing the bag does is keep any frost that may collect from getting on any other foods in your freezer. The next time you want to cook on a Cedar Plank, just reach in your freezer and pull one out, rinse off any ice that may have formed, and your ready to put your food on the planks and put it on the grill or in your oven. You may	want to put the plank on the grill or in the oven while it is heating up to warm the plank, but it is not necessary. Our Cedar Cooking Planks also Work Great in your Oven! I recently did a side by side comparison. I bought a two pound fillet of Salmon on Sunday and seasoned it with my special seasoning (soon to be sold by Nature's Gourmet™) and put it in the frig. I left it there over night. I also soaked two planks and placed the in the freezer because I knew that I would not have time to soak the planks Monday night when I wanted to cook the fish. Monday night, I came home and took my planks out of the freezer, preheated my oven to 350 degrees and fired up my grill to medium heat (I do not have a thermometer on my grill). I cut the Salmon in half and placed one half on one plank and the other half on the other plank. After about 15 minutes, I placed one plank on my grill and the other in my oven. I set a timer for 15 minutes and went and changed. After 15 minutes I checked both planks and determined that they both had another 5 minute to go. After five more minutes, I pulled them both out and they were ready to eat. Both perfectly succulent, moist and had that great cedar taste. The only real difference was that the Salmon that was cooked on the grill had more of a cedar smoky taste because the plank on the grill smoldered to give the smoky taste. The plank in the oven did not char or smolder so there was no smoky taste. Even though it did not have the smoky taste, it was still very delicious. If you think about it, it is good that the plank in the oven did not smolder, if it had, my kitchen would have smelt like smoke and may not have been very appetizing. These are two pictures of the two different pieces of Salmon. The one on the plate is the one that was on the grill. The reason that it is not on the plank, is because my wife does not like me to bring the smoldering plank into the house because of the heavy smoky smell. The one on the plank is the one from the oven, I have it setting on my cutting board because it is hot. Notice on the piece made on the grill (upper photo), the lower right area next to the silvery/white back side of the skin, that the pink salmon is shinny because it is very moist. Also notice that the one from the grill (upper) has a little darker look because of the plank smoldering and giving it a smoky cedar flavor and color. Remember never leave your oven or grill unattended for any length of time when using cooking planks, the wood can dry out and catch on fire. Always have a spray bottle of water handy so if the plank does catch on fire, you can spray water on it. Cooking on cedar is fun, easy, clean and convenient. How can I tell when my fish is done? Wait 5 minutes and go back to the grill and check again, this time in a little different spot. Notice that the place that you cut the first time will have healed (see the photo above of the salmon that is on the plate, it has a pinkish line across the middle where I cut into it to make my 10 minute test). This time if it feels like there is no resistance. like it may be done, with the fork in the fillet, try to use the fork to peel back one side to check what color the fish is. 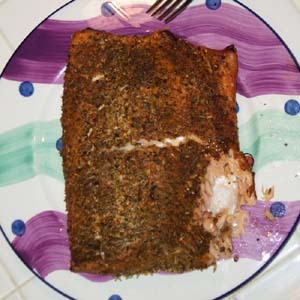 With Salmon, it will be slightly pinker if it is less cooked. I am a sushi lover and I like my Salmon (and all my fish) on the rare side, so I would tend to cook my fish less. For those that like it a little more done, again look toward the center of the cut (thickness) and notice , if it is a silky color, it is less done, if it is a slightly duller color, it is cooked all the way through. 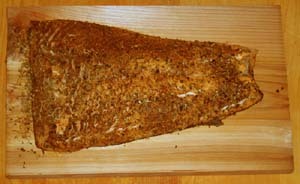 A word of caution when looking at the color to determine doneness, cooking on cedar, because of the added moisture, the fish will most always have a more shinny look inside because it is very moist and not dried out. If you need to, again using your table fork, spear down into the fillet making a small square and gently digging it out to look and taste it to see if it done enough for you, if it is, remove the plank and fish onto a heat resistance plate, server or surface. You can then take the plank and fish into the house or remove the fish onto a nice serving platter and serve. The above also goes for using our cedar planks in your oven. Remember not to set your oven above 350 Degrees F when cooking with our cedar planks. Temperatures above 350 may cause the plank to catch on fire. Never leave your oven or grill unattended for any length of time and always have a spray bottle of water handy. Can I use my planks for more then one use? It may be possible to use our cedar cooking planks for more then one use. The main factor in determining whether or not you wish to reuse a plank is one of bacteria left over from the food from the first use. Other factors that determine multiple uses are as follows. You make the ultimate assessment. The planks is split or cracked. The planks is completely charred on the underside and heavily charred on the sides. The reason being, a charred plank will not hold as much moisture and the already charred wood will tend to give your food a charred burnt wood taste instead of a delightful smoky cedar flavor. The plank is excessively bowed or warped. In most other cases, you can try a plank for a second time and learn when to and when not to reuse a plank. I would never reuse a plank when I was cooking for a special occasion or for company or family. Until you understand the possible pitfalls of reusing a plank, experiment first. Be very careful when reusing a plank that you cooked chicken, burgers or certain other meats. Make sure that you clean the plank sufficiently with soap and water and let dry. When you are ready to reuse the plank, soak and make sure that you preheat the plank for 10 -15 minutes to rid any bacteria from the wood. Share your tips and recipes with us and others by writing to recipes@gourmetcookingplanks.com. Thank you!